According to a new study, headed by the University of Southampton and involving a group of International Researchers, massive CO2 emissions from volcanoes were responsible for the extreme global warming event that occurred 56 million years ago, during the formation of the North Atlantic Ocean. The study has been reported in Nature. 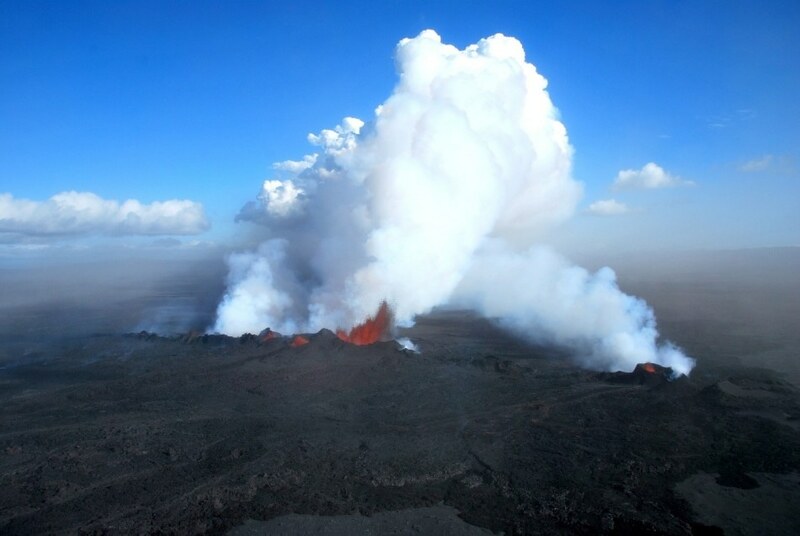 Icelandic rift today erupting lava (Credit: Morgan Jones and Henrik Svenson). In this study, a combination of novel global climate modeling and new geochemical measurements was used to demonstrate that in less than 25 thousand years atmospheric CO2 more than doubled during the Palaeocene-Eocene Thermal Maximum (PETM) – all caused by volcanoes. Of the last 66 million years, the PETM is considered to be the most extreme and rapid natural global warming event which continued for about 150 thousand years and increased global temperatures by at least 5 °C – a temperature increase that was similar to projections of current climate beyond the end of this century. It has been suggested for a long time, that the injection of carbon into the atmosphere and ocean contributed to the PETM event. The ultimate trigger – the source of this carbon – and the overall amount released have all been a mystery, until now. Scientists were aware of the fact that the PETM event more or less coincided with the formation of huge ‘flood basalts’, which are large stretches of ocean floor with the continents covered in lava, caused by a series of massive eruptions. These took place as North America and Greenland first started breaking from North-Western Europe, which resulted in the creation of the North Atlantic Ocean, the remnants of which are still present in miniature in Iceland even today. However, the proof linking these massive volcanic outpourings to the carbon release and global warming that highlights this PETM event was evidently missing. At the University of Southampton, the geochemical facilities are one among the few locations in the world where this kind of study can be performed. Foraminifera are small marine planktons that live close to the sea surface; their tiny shells have a unique chemical composition that records the environmental conditions of the period when they lived, some millions of years ago. Ocean pH tells us about the amount of carbon absorbed by ancient seawater, but we can get even more information by also considering changes in the isotopes of carbon, as these provide an indication of its source. When we force a numerical global climate model to take into account both sets of changes, the results point to the large-scale volcanism associated with the opening of the North Atlantic as the primary driver of the PETM. Farming is a Business and What is the Better Strategy - Conventional Cropping or Organic? The Researchers discovered that the PETM was linked to a total input of over 12,000 petagrams of carbon from a largely volcanic source. This is indeed a huge amount of carbon – about 30 times larger than all the fossil fuels burned so far and comparable to all present unconventional and conventional fossil fuel reserves. In the Researchers’ computer model simulations, it increased the concentration of atmospheric CO2 from about 850 parts per million to more than 2000 ppm. The Earth’s mantle contains carbon that is more than sufficient to explain this spectacular increase and most probably it would have been released as magma flowed from volcanic rifts at the surface of the Earth. How the ancient Earth system responded to this carbon injection at the PETM can tell us a great deal about how it might respond in the future to man-made climate change. For instance, we found that Earth’s warming at the PETM was about what we would expect given the CO2 emitted and what we know about the sensitivity of the climate system based on Intergovernmental Panel on Climate Change (IPCC) reports. However, compared with today’s human-made carbon emissions, the rate of carbon addition during the PETM was much slower, by about a factor of 20. Dr Philip Sexton from the Open University in Milton Keynes continues, “We found that carbon cycle feedbacks, like methane release from gas hydrates which were once the favoured explanation of the PETM, did not play a major role in driving the event.